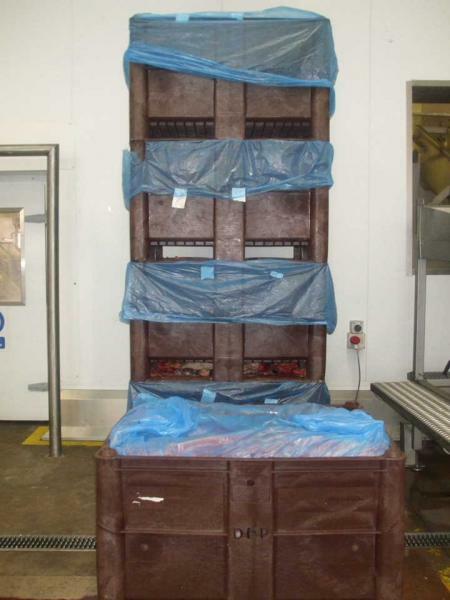 With some 30-40 Dolavs in three different colours (brown, blue and grey) for each of three suppliers at four sites, Duncrue Food Processors (DFP) has more than 160 on continuous cycle. They go out empty and come back, plastic lined and full, in curtain-sided lorries. Thirty or forty full Dolavs come in daily. Each contains five hundred kilos of fat. From Belfast, DFP's beef dripping goes to the UK and Ireland fast food industry, mostly fish and chip fryers, catering for baking and suet pastry, and to hotel and restaurant catering. The full Dolavs are forklift tipped into receiving bins and while upside down are supported by their tough integral rails, one of several reasons why DFP chose Dolavs. 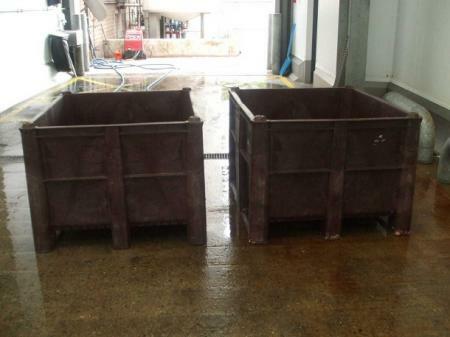 "Because the plastic Dolavs, by comparison with metal containers, are much lighter, we can fully load a 40-foot trailer with 50 full Dolavs stacked two high and stay legal on weight," said managing director, Colin Tweedie. "They are easy to stack and load and stand up well to abuse from forklift drivers at some suppliers who see them as 'waste bins' and may push them around with the truck forks," he said, reckoning the long life of a DFP Dolav to be 3 years with some/most still in use after four years. At the meat processors, staff putting in the animal fat can drag an empty plastic Dolav to where it is needed but not a metal container. High quality food-industry specification Dolav plastic also plays an important part. DFP operates to BRC Grade A standard easily met by their Dolavs - which also match the equally demanding EC approval and Department of Agriculture requirements for meat plants. When Dolav washing is required, DFP uses chemical-free water at over eighty-two degrees Celsius - ready for their next out-and-return trip.